This was the sentiment from Leonard Arnold, a surgical technician at Advocate Illinois Masonic Medical Center. Arnold was explaining a situation in an OR where the surgical team was participating in a “time-out” — a pre-surgery routine where all surgical staff take time to ensure they are operating on the correct patient, the correct site and the correct procedure. But there was one important person missing from this time-out: The performing surgeon. In Arnold’s story, the surgeon had refused to participate until a hospital official finally reprimanded him. While surgeon-patient trust is often discussed, trust and collaboration between a surgeon and his or her staff can be overlooked. Improved collaboration not only creates more trust among your staff, it also helps improve the patient experience. Don’t forget your humanity: Would you trust someone who came up to you on the street and asked for money? Probably not, likely because you don’t know the person. The same holds true for a work environment. Let your staff get to know a little bit about you personally. Do you have a favorite hobby you like to do outside of work? A favorite food or snack from the cafeteria? A show you watch every Tuesday night? Sharing small pieces of personal information can help you seem more human, let your staff get to know you on a personal level to help build trust. Get to know your staff: Just like sharing some information about you can help your staff feel comfortable working with you, the tactic goes both ways. Getting to know your staff — and what they enjoy both inside and outside of work — can help staff members feel more engaged. 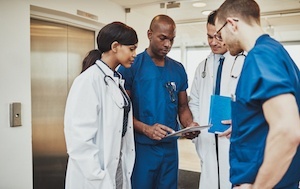 Do a team huddle or time-out before beginning a procedure or new case: Even if a time-out is standard at your hospital, participating in a huddle before beginning can serve as a final check to make sure everyone involved in the procedure understands the plan. If you haven’t implemented time-outs yet (mandatory in the US since 2004), this information from The Joint Commission can help your teams get started. Celebrate: An increase in trust will also mean an increase in performance or morale. Celebrate the little and big successes of your staff. Maybe an intern or student nurse successfully completed a procedure he or she had never tried before. Or maybe your surgical team had successes on a difficult case. Or maybe a patient praised a staff member for his or her bedside manner. Whatever the case, try to acknowledge the wins your team accomplishes. Improving staff communication and collaboration doesn’t have to be a big effort. By making a few simple changes in the how and what you communicate with your staff, you can improve morale and performance. Do you have any communication tips? Share your favorites in the comments.